Spring Thaw 2014 Fenner Hill Tournament! Snow and cold got you down? Clubs packed away and gathering dust? Worn out the carpet practicing with the flat stick? Say good bye to the WINTER and Hello to SPRING! With the help of Mother Nature and her thaw, the ground will be visible again and spring is right around the corner. 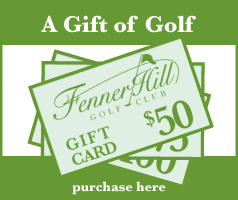 This is why we are hosting the “SPRING THAW” Tournament at Fenner Hill Golf Club. It’s a two man, best ball gross event held over two days. First round best ball score from your team seeds you with similar scores and enters you into your flight. Day two is again, two man best ball gross. Your total two day team best ball gross score is what will determine your flight winners. *Only $135 per person: 2 rounds with cart and prize $$$. Sign up soon for this two day tournament as space is limited. When: Saturday, April 12th & Sunday, April 13th, 2014. Print the registration form and follow the mailing instructions to secure your spot. Looking forward to seeing you on the course and enjoy two days at a great track!